Homemade cookies are many people's favorite dessert. 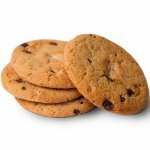 The list of best-loved types cookies includes, but is not limited to: chocolate chip cookies, oatmeal raisin cookies, ginger cookies, peanut butter cookies, snickerdoodles, sugar cookies, macaroons, triple chocolate cookies, macadamia nut cookies. To celebrate the National Homemade Cookies Day, bake some homemade cookies and eat them. Don't forget to share the cookies you've made with your family, friends, neighbors, and co-workers. Cookies are not particularly hard to make, but you need to know some tricks to make really tasty cookies. For example, all ingredients must be room temperature. Be sure to take eggs and butter out of the fridge beforehand. Let's figure out how to cook easy chocolate chip cookies. In a large bowl, mix 125 g unsalted softened butter and 100 g brown sugar. Add 1 egg and 1 1/2 tsp vanilla essence. Mix again. Sift in 225 g self raising flour and 1/2 tsp salt, combine well. Add 200 g chocolate chips and mix. Shape dough into 1-inch balls and place them on a baking tray lined with waxed paper. Bake the cookies at 390 °F for about 7-10 minutes.